In 2015, Vermont was one of ten states chosen by the United States Department of Agriculture (USDA) to develop and test strategies for reducing dependency on the national Supplemental Nutrition Assistance Program (SNAP). Vermont’s SNAP Program, called 3SquaresVT and administered by the Department for Children and Families (DCF), was awarded a three‐year $8.9 million dollar grant to develop a job readiness and training pilot program for people getting benefits. Vermont’s pilot, called Jobs for Independence (JFI), began accepting applications at the end of February 2016. 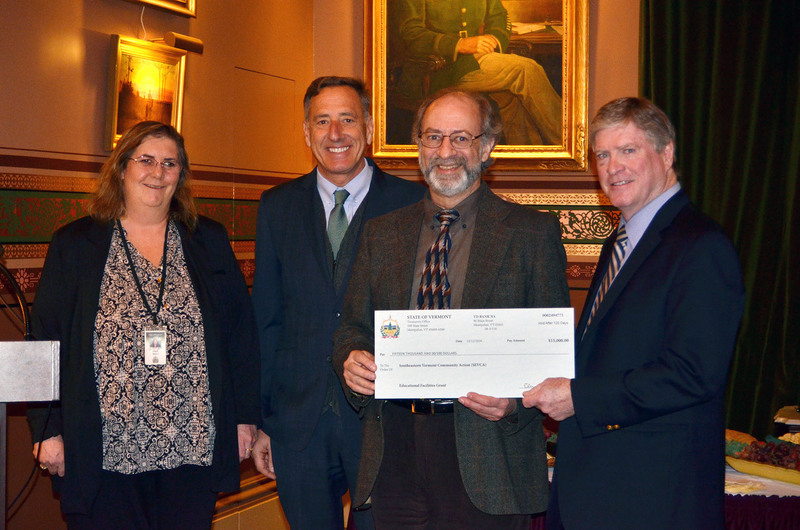 Pictured (from l. to r.): Diane Nealy, Agency of Human Services; Governor Peter Shumlin; Steve Geller; and Senate President Pro Tempore John Campbell. A $15,000 Vermont Building Communities Grant awarded to SEVCA by the Department of Buildings and General Services will help pave the way to a new, renovated facility for the organization’s Head Start center in Windsor. Steve Geller, SEVCA’s Executive Director, accepted the award at a ceremony at the Statehouse on December 13. SEVCA’s Head Start program provides comprehensive early childhood education and family support at no cost to low-income children and their families in Windsor County, typically serving around 100 families annually. The program has been without a facility in Windsor since the lease for its center-based program at the Old Windsor Firehouse was not renewed in 2015. The organization has been able to continue serving Windsor families since then via a combination of placing some children in its White River Junction center and providing a ‘home-based’ program to some others, but children would benefit more fully from a center-based experience in their own community. The center-based Head Start program consists of a minimum of 16 hours a week of classroom time, which next year will expand to 30. SEVCA has identified a building on the corner of Main and Bridge Streets to serve as its new Head Start center, and is in the process of purchasing the property from its current owner, the American Precision Museum. The renovation will consist of a complete rehab, including exterior and interior repairs and renovations, minor foundation repair, roofing, interior walls, new windows and doors, bathrooms and kitchen, new plumbing, electrical and HVAC systems, and weatherization. SEVCA is currently assembling funds for the purchase and expects the sale to be finalized within the month and the new center to be opened in time for the next school year in September. View an article in the Valley News with more detail about SEVCA's plans HERE. When this article was published, the status of a $300,000 grant from the Office of Head Start was not known, but since then, we've learned the grant was approved, and all financing is now in place to purchase and rennovate the new site. If you’re expecting a tax refund based on filing for the Earned Income Tax Credit (EITC) or the Additional Child Tax Credit (ACTC) on your income tax return, you might not get it as soon as you expect this year. Due to a new law, the IRS will be waiting until February 15 before they’ll begin making direct deposits or mailing tax refunds. In practical terms, even for those who file in late January, the earliest most will get their refunds will be the week of February 27. Many people depend on their refunds to pay for major expenses or debt they’ve incurred over the holidays. Starting this year, it’s important to plan for the delay in getting your refund and expecting to pay for those expenses out of existing resources. Tips for coping with the delay can be found HERE.